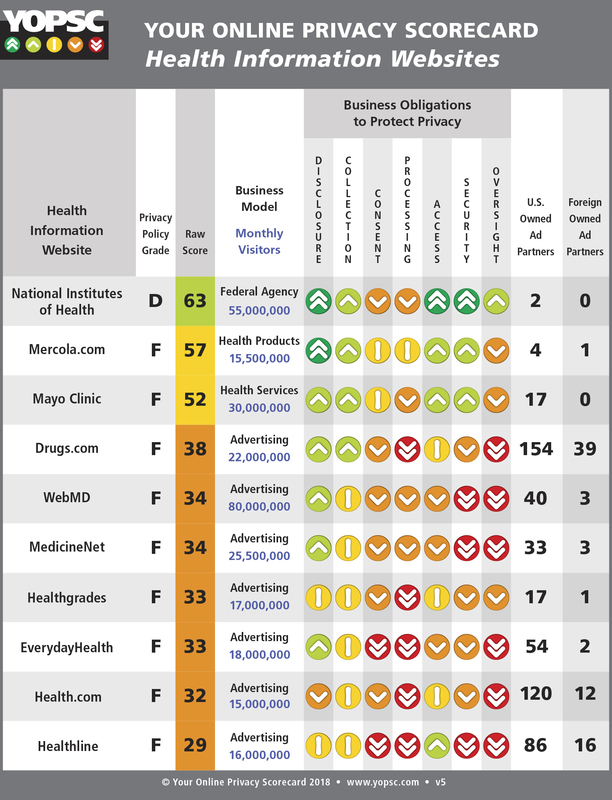 Today Your Online Privacy Scorecard announces the publication of the first scorecard for Health Information Websites. “Our mission is to educate the public on how well business meets their obligations to protect the privacy of personal information”, said YOPSC founder Robert Rich. ‘This scorecard highlights the challenge of balancing business use of technology with our individual rights to be left alone”. Only one of the top10 most visited health information websites rates a passing grade. “Health Interests” captured in search terms and pages viewed are connected to individuals using identifiers like internet protocol address and browser fingerprints. Personal information including health interests collected during website visits searching for health information is used to build extensive reputation profiles by a worldwide network of data brokers and advertising technology vendors. Personal reputations are for sale - used to make decisions automatically about important aspects of daily life including advertising, leases, loans, insurance and employment. Some health information websites invite more than 150 third parties located all over the world including Russia to collect and use detailed information about each website visit. The use of technology by business has evolved into personal surveillance - overwhelming fundamental human rights including the right to be left alone. "Your Online Privacy Scorecard Health Information Websites" is available in paperback or eBook on Amazon. Your Online Privacy Scorecards “Fitness Trackers” and “Smart Speakers” are under development. Your privacy and being online are fundamentally out of balance. When you use smart phones, tablets, computers, TVs, and smart speakers you are under technology surveillance. Vendors all over the world collect personal information about you and your behavior without your explicit consent. The context for collection gets lost. Personal information is absorbed into reputation profiles, bought and sold by data brokers – which you have no control over. Decisions are made automatically that impact not just the ads you see, but offers and prices for goods and services, eligibility for loans, approval for insurance, and selection for employment. You have the right to be left alone and control how you present yourself to the world. Privacy scorecards explain how the Global Data About You Network works, how well business protects your privacy, and what you can do about it. Your Online Privacy Summary Scorecard - Health Information WebsitesHow well the top10 websites for health information meet their business obligations to protect the privacy of personal information.